Three key strategies are at the core of Seyfarth’s diversity and inclusion efforts: strengthening our talent pipeline, building our internal-external networks, and implementing an organizational strategy. Our organizational strategy includes: Creating focused programs, policies and business practices that drive change; building active engagement throughout our organization; and delivering on the expectations of our people to build a more diverse, inclusive culture. In late 2016, Laura Maechtlen — then national vice-chair of Seyfarth’s L&E department and the national co-chair of the firm’s Diversity & Inclusion Action Team — helped bring a mindfulness session to the firm’s partner retreat. The session was part of SeyfarthLife, an initiative Laura and other firm leaders were kicking off firmwide in early 2017. 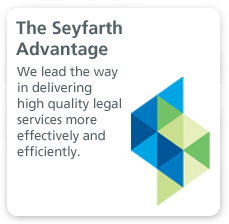 SeyfarthLife is a targeted effort to increase the firm’s organizational resiliency. The program recognizes the importance of work-life integration and its connection to sustaining a high-performing culture. It supports and sustains a culture of self-assessment, improvement, and innovation to enable the highest levels of performance and career satisfaction. Organizational Support: Career paths, benefits, and policies to promote work-life integration. 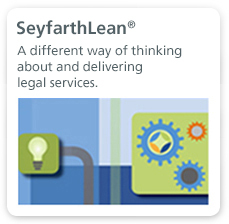 SeyfarthWork & Lean: Process improvement and efficiency coaching to reduce stress. Individual Development: Personalized trainings to promote resilience and well-being. Community: Support groups and mentoring programs designed to increase social connectedness. National Diversity and Inclusion Action Team (DIAT) Network: Seyfarth D&I initiatives are led and implemented by a matrix within the internal organization. Our overall efforts are led by our firm chair and two national co-chairs, with input from the firm’s Executive Committee. In addition, six firm-sponsored affinity groups are responsible for sustaining collaboration and community within Seyfarth and national participation with leading affinity bar organizations. Each office also maintains a local DIAT Leadership Team, focused on supporting the local community and its diversity-and-inclusion efforts. Seyfarth Diversity & Inclusion Day: In 2016, Seyfarth launched its annual Diversity & Inclusion Day, in recognition of the United Nations World Day for Cultural Diversity for Dialogue and Development. We take this opportunity to recognize our D&I Champion, our office-based DIAT communities, and spend time as a firm and in each office honoring the diversity and inclusion within our firm culture. Diversity Scorecard: Our firm actively assesses its own performance on diversity and inclusion based on a comprehensive list of factors defined by clients, bar associations, and other surveys on a quarterly basis. Points of measurement include recruiting efforts, demographics, and utilization rates. Policies and practices: We develop policies and practices with a diverse workforce in mind, and have won national recognition for these practices from the Diversity & Flexibility Alliance, Working Mother magazine, and the Human Rights Campaign. For the 10th year, Seyfarth recognized as one of the "Best Places to Work" by HRC Foundation. 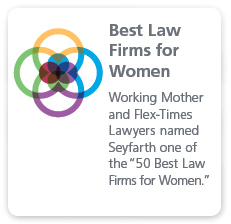 Working Mother named Seyfarth one of “50 Best Law Firms for Women." Read our report about our diversity efforts.